Lives of the First World War (LFWW) was launched to the public last week. In their publicity blurb the Imperial War Museum state that they want families to add their own photographs, stories and memories to build a "permanent digital memorial" to the people from Britain and the Commonwealth who served in the war. Read this article by the BBC. I have written three posts about this project so far, two whilst I was taking part in the beta testing prior to the public launch. One here about my hopes and first impressions of the site and another here about the Communities feature. Then I wrote another post last week after the launch in response to the difficulties people were having using the site. One writer on the Great War Forum was kind enough to comment that my blog post was, "the way the user manual should have been written"; thank you sir! But that doesn't help the hundreds or is it thousands of people trying to use the site with recourse only to the site's own help messages. This weekend I went to stay with my daughter and her partner in Leicester and after a suggestion by the OH (my other half) we carried out an experiment to see how easy it really was for a non-family historian to add data to the website. I have over 20 years experience of family history and have had a full subscription to Ancestry for over 9 years and to Find My Past for 2 with previous pay by view visits for occasional items. I regularly research WW1 soldiers for my own family history and for the Barnsley War Memorials Project. I am not really an average tester for this new site. My three testers, the OH, my daughter and her partner were each assigned a WW1 soldier from the OH's family tree. I gave them name, service number, regiment and date of death. I asked them to add the date of death to the man's record on the LFWW site. The OH, M48, to use the parlance of Mass Observation, is very computer literate, edits Barnsley CAMRA's magazine and website and recently won a national award for his guide book to Real Ale pubs in Barnsley. I assigned him his great-great uncle Walter Clarke Priestley. 14th York and Lancaster Regiment, service no. 14/429 who died on 15 April 1918. My mother in law still has Walter's Memorial Plaque, also known as a Dead Man's Penny. I asked my participants to imagine the scenario that they knew about their man as family members who had his name and details via family knowledge and documents. Regiment details and numbers can be found on the edge of medals, on paper work relating to the war and, if the man died, on the Commonwealth War Graves Commission website. I advised my participants that if they hit a pay wall at any point to back out as they should be able to complete the task without any charge. My daughter, F25, who has an Education Studies degree from Leicester De Montfort University and who will be starting her PGCE at Leicester Uni this September (I'm so proud!) 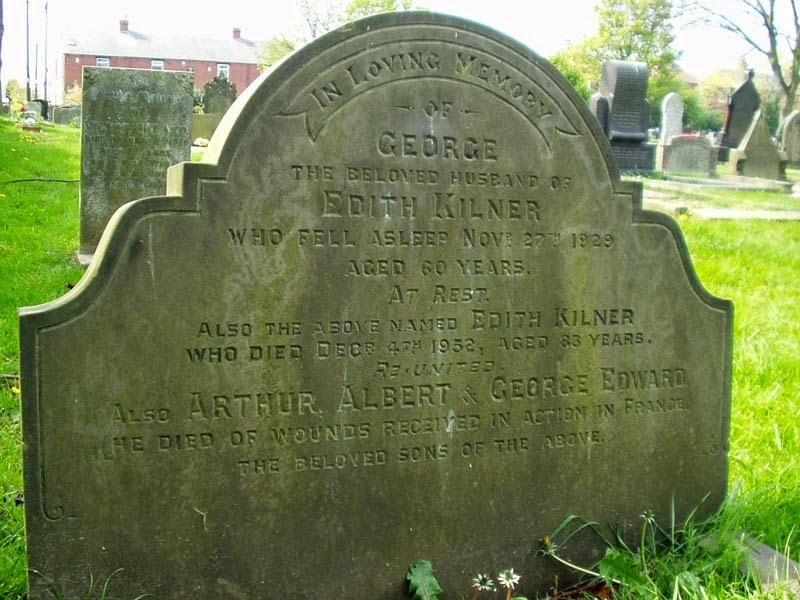 was assigned George Edward Kilner, 13th York and Lancaster Regiment, service no. 13/548 who died on 3 March 1918. He is remembered on his parents' gravestone in Carlton Cemetery, near Barnsley. Her partner, M30, who has a Masters Degree, was assigned George Frederick Jaques, 3rd York and Lancaster Regiment, service no. 3/4541 who died 9 August 1915. The choice of three men was purely based on the OH's family tree and the availability to me of their basic information and a date of death. Many people will NOT have their relative's regiment and service number ... and for men who returned from the war whose Army Service or Pension records no longer exist it is not an easy task to find these out. First comments - why do you have to create an account? You need to have email to do this ... what happens if you don't have email or are using a computer in a library or archives or someone else's computer? Despite what the government tells us I am sure that many people still do not have ready access to email even if they do know how to surf the Internet in a limited way. Why the requirement to set up a difficult password - ie one containing numbers and letters? It's not as if the site was going to contain highly confidential information. F25 - who is dyslexic - commented that the pages are not laid out in a very readable font for people who have difficulty reading. The search page was OK, not a lot of words to cope with, but the Help pages, once she had dug down through five or more pages to find the article on "Adding a Life Story" were too closely packed, the instructional videos had no sound and did not answer her question about how to add a date of death from personal knowledge and that the impression she got was that "you seem to be frowned upon for just KNOWING a piece of information - you just want to put on the website when your grandad died and they aren't telling you how to do that." She was able to find her soldier, George Edward Kilner, but unable to add his date of death to the site. She continued to try to read the help pages while the other two participants worked on their men. I asked her not to give them any clues! M48 was trying to set his man up using a rather old web book computer - well, we were on a visit away from home. He had trouble creating the account, he had to load three different pages on the machine, to create the account, check his email and return to the site. The first few times he tried the search functionality he just got blank pages instead of results. Eventually he did find his man, Walter Clarke Priestley, and then tried to read the Help pages to find out how to "enter a date of death". A search on that phrase gave him 22 responses but none had the word death in them! He impatiently skipped the 90 second tutorials - he just wanted an answer to his question. Suddenly he found he was not logged into the site and that the page wanted him to sign in again. He clicked the logo at the top of the page, which he expected to return him to the home page to restart the process, but it just stayed where it was on the help pages. Eventually I had to tell him to scroll down to the bottom of the page to the small text in the footer and click on the words "Lives of the First World War" to return to the home page. He was getting rather frustrated by this time. Finally with help from comments on the Feedback Forum he managed to add the category of evidence (read my earlier blog if you don't know what this means) "Personal Knowledge of ...." That actually displays his name on the screen - I had forgotten to advise my testers that this would happen and to create aliases - lots of people don't actually want their real names displayed on the Internet, it should be made clear that this will happen before they set up their accounts. He found the entry for date of death in the facts grid below the evidence section and clicked on the pencil icon adjacent a few times, he reported that nothing happened except that he was told to "Improve from Evidence". At this point he gave up in disgust. 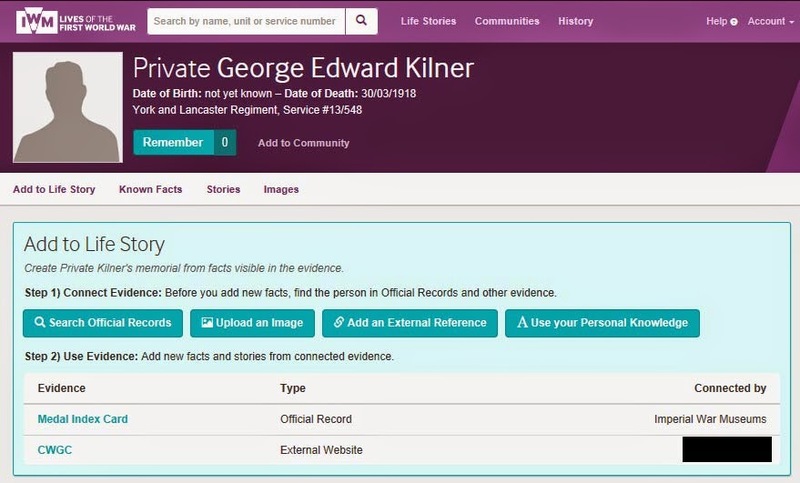 When I showed him that he could have clicked on the Evidence that he had added, his "Personal Knowledge", and entered a story attached to it he pointed out that that wouldn't have helped him achieve his task of adding Walter's death date as the story fields are just narrative and don't link to the date of death field. Quite true. So obvious that I hadn't thought of that before! You can't just add a story and update your man's facts from that ... you have to add at least an External Reference, a website url, the name of book or other source, or the title of a piece of official documentation or other evidence that you have, which could be a letter or a date written on the back of a photo I suppose. But you do still have to work out how to add external evidence. Meanwhile M30 was unable to find his man, George Frederick Jaques, on the site at all. He had a little previous knowledge about resources for WW1 research and tootled off to find his man at the Commonwealth War Graves Commission's website to check his details. He soon found George there and discovered that he was buried in Barnsley Cemetery aged 42. This suggested that George may not actually have ever served abroad, he was older than the other soldiers and buried at home. The LFWW database is, so far, only based on the seed data from the Medal Cards and a man who only served at home, on guard duty maybe or in the reserve, or who was killed during training for example, does not have a medal card. Helpfully for me, M30, then took on F25's man, George Edward Kilner - although he couldn't find him straight away, unlike F25, and had to be shown where the soldier was hiding was by her!! 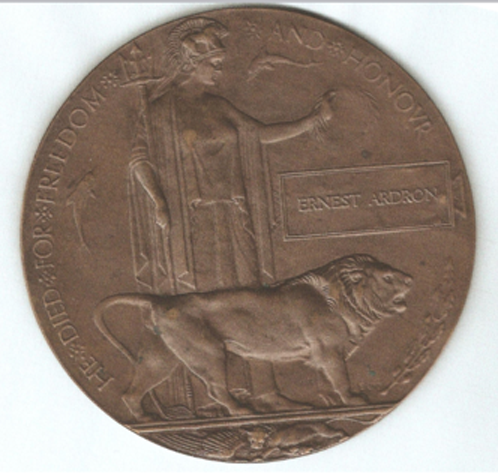 George was listed on his medal card as George E Kilner and M30 had been searching for George Edward Kilner but unable to find him because the search tool on the LFWW does not allow wildcards to be used. Putting in too much information as M30 did brings back only exact results. You can just put in single words such as Kilner or a service number, but in this case the number 13/548 caused complications for M30 as he was aware that the 13 simply denotes the battalion and he had assumed it wasn't needed in the search. M30 then went on to successfully add the CWGC site as External Evidence linking to George's actual entry on the CWGC site. Marvellous! The CWGC is free to access, unlike Ancestry and Find My Past and other pay to view genealogy sites - adding a link like this allows other users of LFWW to view the CWGC site directly. Pop up box when you click on the CWGC evidence in the example above. The grey icon after the CWGC on this screen shot is a link to the CWGC website. He was able to amend George's name to his full name, add his date of death, add his parents' names and the address of George's parents as given on his CWGC records (an assumption that this was George's home address at some point). F25 complained that the site was not accessible by dyslexic people, the training videos had no sound and there were too many pages to drill down through in the Help section before you got information, which was then laid out too densely and in a hard to read font. The suggestion on the BBC news item that the site was created to gather family stories is not borne out by her experience - she felt that little help was available for anyone wanting to do this, all the online help was directed towards people adding evidence from official documents. The pages are unhelpfully laid out with links that appear to lead nowhere, eg the logo at the top of the Help pages and the pencil icon on the facts grid. So IWM, are you going to make some changes to Lives of the First World War to help people add their relatives' stories? I, and all the other experienced users on the site have been giving you suggestions for a while now, when will they be actioned? Great article Linda and what an interesting experiment. Some of the "whining" posts on the IWM site from people who seem to give up after 5 minutes when they find out it's not like FaceBook and won't let them write any old rubbish have annoyed me, but reading this has been most interesting. I think the site is a great idea, but if we don't get some more seed data (RN records and CWGC anyone?) and some improvement to the clunky interface (the misleading blue pencils by the front page data) pretty soon then I fear a lot of people with unique information will be put off and never come back.